Guard Isiah Thomas, left, forward Dennis Rodman, right, and forward Vinnie Johnson of the Detroit Pistons talk to each other during a game in 1988. This Thursday, ESPN1 will air its latest “30 for 30” documentary special, “Bad Boys,” which explores the notorious Pistons era that brought Detroit back-to-back NBA championships 25 years ago. Along with my colleagues at Grantland who are running “Detroit Week,” I’ll be publishing articles relating to the “Bad Boys” narrative and legacy. This is Part 1, in which I’ll examine whether the Bad Boys really earned their nickname. How “bad” were they? That seems like just the kind of thing a data-driven operation might want to quantify. But to figure it out we have to first make sense of what “bad” means in the Bad Boys narrative. For some, the team was heroic — made up of gritty, hard-nosed players who didn’t back down from anyone. And for others, it was exactly that trait — the willingness to do seemingly anything to win — that made them the “Bad Boys,” the team fans loved to hate. When we hear that a player or team is “willing to do anything to win,” it often means they’re willing to practice more than the next guy, spend more time studying film or drawing up plays, or any of the things that we associate with being a good sport. But there’s another connotation: that an athlete or team is willing to do things that others aren’t. They’re willing to transgress the norm of sportsmanship — to be unsportsmanlike in order to gain an advantage. (6) A deliberately-thrown elbow or any attempted physical act with no contact. Though there are some technical fouls not relating to unsportsmanlike behavior, and some behavior that doesn’t ever get penalized, this stat is the closest we have to an official determination of “bad” behavior. But willingness to transgress sportsmanship is meaningless if it doesn’t actually gain you an advantage. If you’re just violating competitive or moral norms for no reason and you’re actually worse off for it, people won’t even respect you enough to hate you for it. So for a team to earn a nickname prominently declaring how “bad” it is, the players should be using their badness to make them better. The Pistons between 1986 and 19924 are the red points. If the first thing you notice is a curiously strong relationship between technical rate and winning (note that every team that had more technicals than the “baddest” Pistons team had a good record), kudos! But we’re going to put that on ice until my next article later this week. So the Pistons look pretty bad, but even their baddest team (1989’s) had only the 15th most technical fouls since 1982. The 1995 Seattle Supersonics (who came within two games of beating the 1995 Chicago Bulls for the NBA title, which is probably more impressive than most championships) were badder and better than both the baddest and the best Pistons squads. But that’s not an entirely fair comparison. 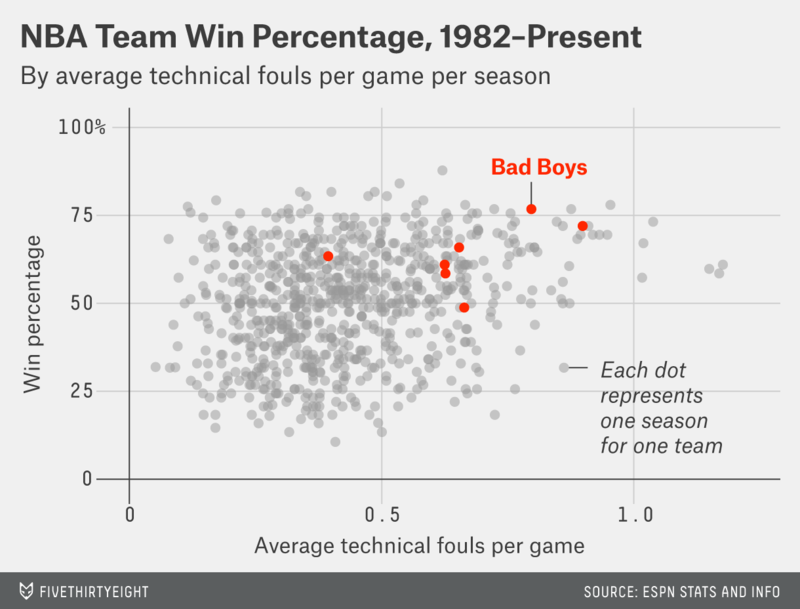 The Bad Boys Pistons practically led the revolution in unsportsmanlike play in the NBA, practitioners of the technical foul just as the technical foul became more prevalent. 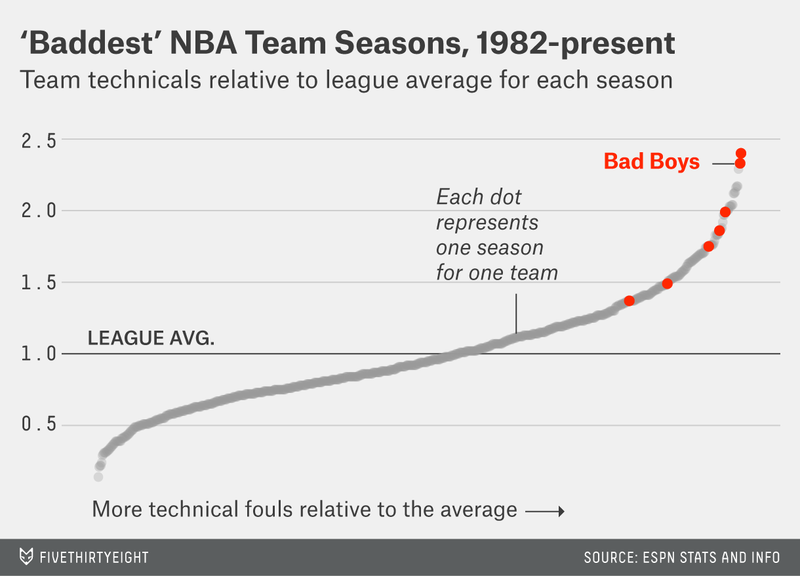 The red part is the “Bad Boys Era,” though the numbers are league-wide.5 Meanwhile, that 1995 SuperSonics squad came at the all-time peak for technical fouling. To see how these Pistons would have looked to people in their era, here’s the first graph above, but with all the non-Detroit teams after 1988 filtered out. Now that’s more like it. All six of the seasons after 1986 (Dennis Rodman’s rookie year) are badder than every season prior to 1989 in our data set.6 Detroit only finished one season below .500,7 and won two championships in the other seasons. Boom! Using badness relative to a team’s era as the measure, the top two baddest teams are the two Bad Boys teams that won championships. For once, a harder look at the data seemingly confirms rather than undermines a popular sports narrative. 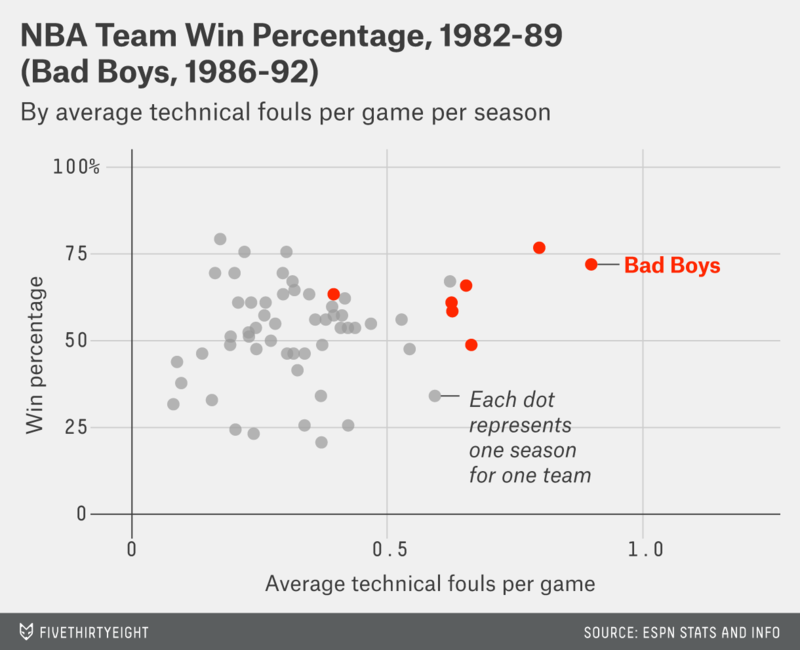 But there’s something even more fascinating going on here: Technical fouls are bizarrely predictive of success. Individually, they give the other team a free attempt at another point, which should have about the same effect on the game as a turnover; they have no business indicating strength as well as they do. But they do. Not only are better teams more likely to get technicals (and vice versa), but “bad” plays may themselves add value. In other words, the Bad Boys may have been onto something. How and why this effect works turns out to be a fascinating and complex issue, and it will be the subject of the next article in this series, out later this week. Corporate parent of this website, among others. We could build an ad-hoc model for “badness” based on perimeter defense, offensive rebounding, fouls, technical fouls, ejections and other things we normally associate with the Pistons of this era. But such models are just numbers-y versions of opinion. Technical fouls aren’t kept in normal box scores at either the team or player level, so the relevant data is hard to find and gets weaker and weaker the further back we go (unfortunately the Bad Boys played in the pre-play-by-play era). However, I’ve compiled all the data on individual player technical fouls from ESPN.com’s player stats database. Though incomplete (many less-well-known players don’t have stats), most of the high-minutes players from back into the early ’80s are covered, so reasonable team estimates are possible. Fortunately, we don’t have to discriminate between a bunch of close cases. There is dispute over what constitutes the “Bad Boys Era.” For example, Wikipedia lists it as 1979-1994. Perhaps that’s true for the broader narrative, but for analytical purposes I’ve chosen to use the seven years when Dennis Rodman, Joe Dumars, Isiah Thomas and Bill Laimbeer all played together. 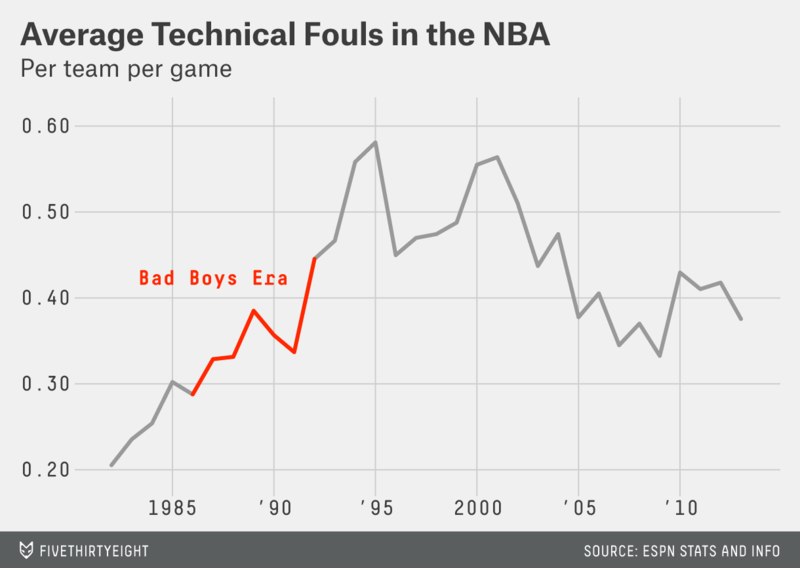 The league-wide technical foul rate before and during the Bad Boys Era may have been even lower than it appears in the chart. Because of the Pistons’ prominence and success, they are better-represented in the older, less complete data than a normal team would be — meaning they may be skewing the league averages towards themselves. Not shown: After the Pistons won their first championship (1988-89 season), you start to see an uptick in aggression in the NBA — though hard to prove, this may be a result of other teams emulating the Pistons’ style. In the 1992-93 season, the Pistons actually won 58 percent of their games with Dennis Rodman in the lineup, but went 4-16 without him, leading to their only losing season of the era. More on Rodman’s impact later this week. In addition to making rankings like this possible, this turns out to be the best technical-related metric for predicting current and future team success. The presence of more teams near the top of the rankings suggests that the league hasn’t just been getting more technical-prone uniformly, but that the increase is being driven by the extremes.